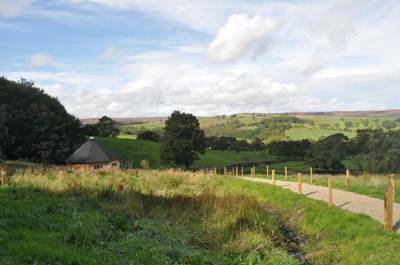 Located near Pateley Bridge in Nidderdale, North Yorkshire. Our site is located on the edge of our working dairy farm overlooking the wild, untouched landscape of the Yorkshire Moors. We have five octagonal log cabins, each sleeping a maximum of four guests in one double bed and one set of single bunk beds. Each cabin includes a log burning stove, a BBQ and basic crockery and cutlery. Three of our units have shared washroom facilities, two have private, en-suite shower rooms. There is a small kitchenette with a kettle, toaster, microwave, fridge and washing up facilities. For latest availability and best prices for Little Seed Field, please use the Date Search above. The area is classified as an Area of Outstanding Natural Beauty, with plenty of wild birds of prey, deer, bats and hedgehogs. You can walk to the heart of Nidderdale, with direct access to rare heather moorlands which are protected as a Site of Special Scientific Interest (SSSI). 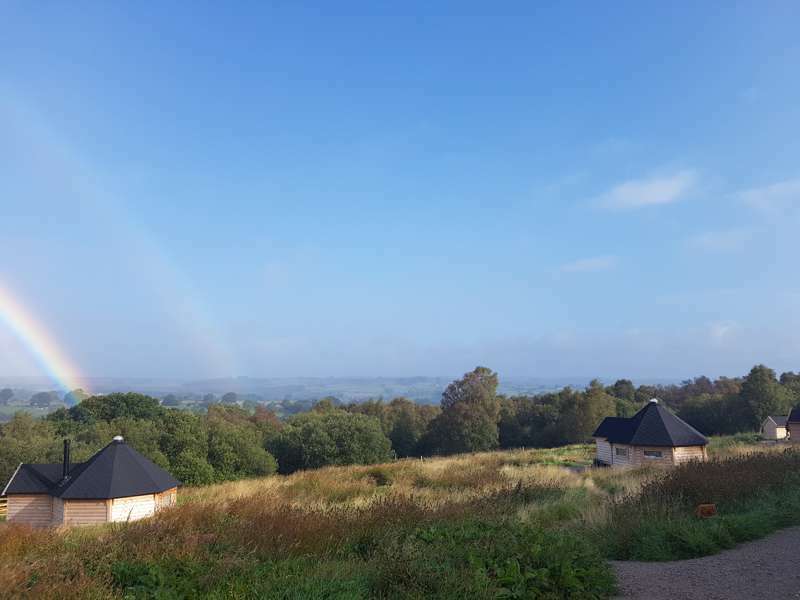 Due to the remote location, the cabins do not have en-suite bathroom facilities, these are shared in a separate amenity building, just a short walk from the cabins. Guests should bring their own duvets, sleeping bags and pillows (the owners can provide these for you for an extra charge). 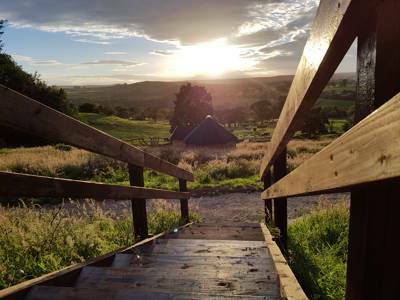 The site is a short drive from the Nidderdale Way – a very popular 52-mile circular footpath that encompasses a landscape unchanged in millennia, and outstanding in its natural beauty. There are plenty of places to visit close by: the market towns of Pateley Bridge, Masham and Ripon, and a number of National Trust sites including Fountains Abbey and Brimham Rocks. Little Seed Field is only an hour drive from both Leeds and York, whilst nearby Pateley Bridge is an award-winning village, winning awards in the recent 'Best High Street' competition. Each cabin has a private BBQ, plus there's the option to heat food on the stoves hotplate. There are two award-winning butchers in Pateley Bridge, plus a superb fish and chip shop come take away pizza place in the nearest village of Kirkby Malzeard (2 minute drive). As for pubs, The Grantley Arms (01765 620227) is a fine old inn in the charming village of High Grantley, whilst the Queens Head in Kirkby Malzeard serves local ales on draught. Leave the A1 at Boroughbridge and follow signs to Ripon, then Kirkby Malzeard, and then Laverton. Follow the road through Laverton, over the hump back bridge, and after 1/2 mile turn right at the T junction. Follow the road for 1.5 miles, Castiles Farm is on the right hand side after passing The Moorhouse B&B. Follow Sat Nav HG4 3RH, the farm is 1/4 miles beyond the B&B, before the cattle grid. Little Seed Field is very remote and only reached by car, there are no bus or train services. Taxis operate from Ripon where there is a decent size bus station connecting to Leeds, Harrogate and Masham. 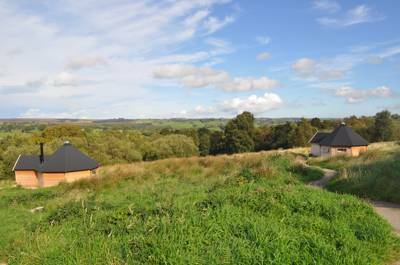 3 furnished octagonal wooden cabins, each with clear views of stunning moorland scenery.